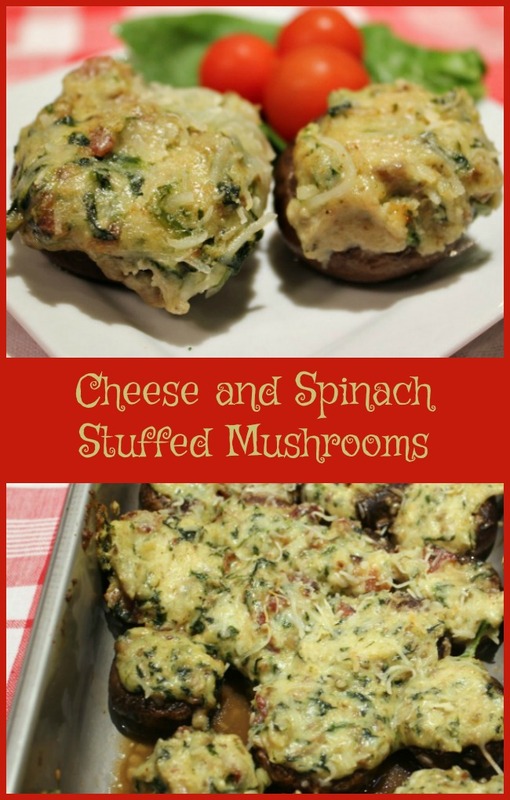 Cheese and Spinach Stuffed Mushrooms are a delicious, warm, cheesy and filling addition to an appetizer table. You can also serve them as a side dish at a pot luck. Sooo good. Unless you talk to someone like Bytes who can only mumble “fungus”. That’s okay – more for the rest of us. And they disappear quickly so don’t dally in loading your plate. Look for packages of larger baby bellas in your produce section. Larger mushrooms are easier to stuff and handle without breaking. When dicing the stems and cutting the spinach, make the pieces small so they will blend into the mixture evenly. Italian mix cheese is not available at every store; Kraft is the brand I find most often. If you don’t find it at your store, use shredded parmesan and romano. Bake until the cheese is golden and mushrooms are tender. The number of servings will depend on the size of the mushrooms available to you. I had more than twenty when I made this batch because they were smaller. Big or small, they are a wonderful addition to the table! Cheese and Spinach Stuffed Mushrooms are a deliciously warm and cheesy, filling addition to an appetizer table. In medium mixing bowl, combine cream cheese, bread crumbs, Italian cheese mix, egg, salt and pepper. Mix thoroughly. Add spinach, mushroom stems, and garlic to cheese mixture. Mix well. Sprinkle lightly with remaining Italian cheese. Bake 17 to 20 minutes, until golden and mushrooms are tender.